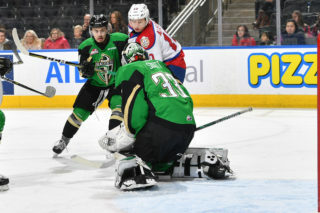 Another determined effort yielded yet another well-deserved outcome for the Edmonton Oil Kings on Saturday night. 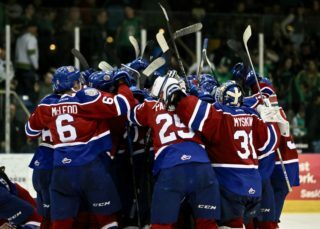 For the second time in as many games the Oil Kings (29-15-4-4) rallied to victory, this time 4-3 in overtime, over the Saskatoon Blades in front of 3,800 (which included many Oil Kings player families) at SaskTel Centre. 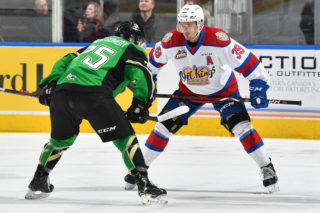 The Oil Kings found themselves in a tight-knit battle all night long before the Blades took a one-goal lead with just over eight minutes left to play in the third period on a power play goal. But continuing their trend as of late, there was no relent in Edmonton’s game as Conner McDonald kept his torrid offensive pace going to tie the game late, 3-3, to send things to overtime. Captain Trey Fix-Wolansky scored just 30 seconds into the extra frame to give his team their eighth win in their last ten games (8-1-0-1). McDonald’s impact on the scoresheet has been nothing short of stunning, as the Delta, BC native moves into second overall in goals scored by a defenceman in the WHL with 16 goals. 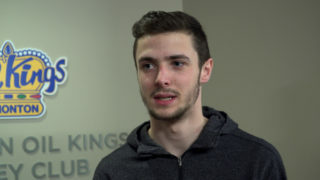 The rearguard moves into second overall in career goals by an Edmonton Oil Kings defenceman in the modern-era, having scored 33 goals in 154 regular season games. He now trails only long-time Oil King and former captain, Aaron Irving (38), who dressed in 244 regular season games for the Club. Dylan Myskiw (19-10-2-3) returned to the crease for the Oil Kings and kept their winning ways alive, turning aside 38 saves on 41 shots while earning the game’s Third Star. Nolan Maier (25-9-6-0) took the overtime loss, allowing four goals on 35 shots. The opening goal of the game came just 3:46 into the first period as Gary Haden gave the Blades a 1-0 lead, his 24th of the season, on the power play assisted by Nolan Kneen. But with under five minutes to play in the frame McDonald kept his hot streak alive, burying a seeing-eye shot from near the faceoff dot to the left of Maier to tie things up, 1-1, unassisted at 15:29. Vladimir Alistrov gave the Oil Kings the 2-1 lead with his eighth of the season, dancing around a Blades defender at the hashmarks at 17:42, from Josh Williams and Ethan Cap. Shots through the first period of play were deadlocked at 11-11. Late in the second, Haden buried his second of the night to once again tie things up, 2-2, which proved to be the lone goal of the middle period. The Oil Kings outshot the Blades 14-11 in the second period, for a two-period total of 25-22, Edmonton. 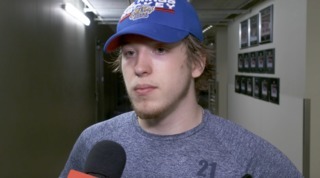 The tone of the game shifted in the Blades favour when the Oil Kings were assessed a five-minute major penalty on which Saskatoon capitalized, as Max Gerlach made it 3-2 Blades at 11:54. But with 4:20 left to play, Blades forward Kirby Dach was called for hooking and the Oil Kings enjoyed some special teams retribution of their own. McDonald’s offensive efforts continued with a blast from the top of the circle with 3:09 left to play in regulation to make it a 3-3 game, from Quinn Benjafield and Fix-Wolansky, to send the game to 3-on-3 overtime. Fix-Wolansky wasted no time in the extra frame tallying his 28th of the season, unassisted, just 30 seconds into overtime to give the Oil Kings their second win in as many nights. Shots on goal in the third period of play were 16-12, Saskatoon in the third, and 1-0 – Fix-Wolansky’s game-winning snipe – in extra time. Saskatoon was 2-for-4 on the power play, while Edmonton finished the game going 1-for-2 with the man advantage. Dylan Myskiw (EDM) (3), Gary Haden (SAS) (2), and Conner McDonald (EDM) (1) were selected as the Three Stars of the Game. Wyatt McLeod, Ethan Cap and Andrew Fyten each wore an “A” and skated as alternate captains to Trey Fix-Wolansky. The Oil Kings return home to Rogers Place to take on the Prince Albert Raiders for the second time in four nights on Monday, February 4 at 7:00 PM MT. 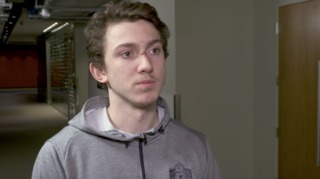 The game was originally scheduled on Wednesday, February 6 but instead will take place on Monday, February 4 at 7:00 PM MT.